Four Seasons at Beaumont is perched between the San Gorgonio and San Jacinto Mountains at an elevation of 2,400 feet. The higher elevation provides for both gorgeous views and moderate year round temperatures. 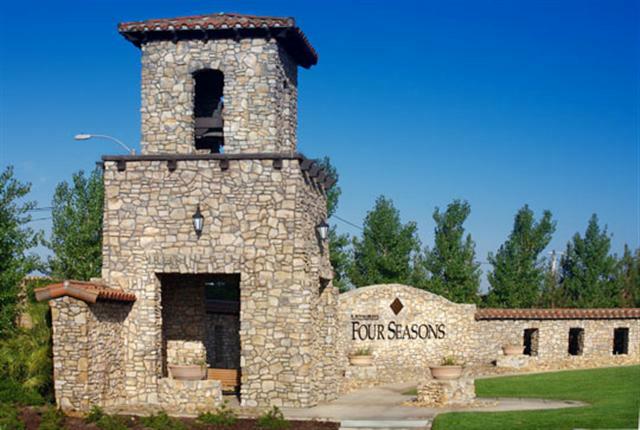 Four Seasons at Beaumont is situated in the scenic San Gorgonio Pass area of Riverside County in Southern California. The moderate weather allows residents to participate in outdoor activities year-round. San Gorgonio Pass is one of the deepest mountain passes in the 48 contiguous states, with its sides rising to almost 9,000 feet. With glorious nature at one’s fingertips, and exciting cities like San Diego and Los Angeles just two hours away, residents of Four Seasons at Beaumont have no reason to ever feel bored. At this gated 55+ community, a full-time activities director organizes activities, clubs, social events, and outings. To make sure that every resident has easy access to the amenities and activities, Four Seasons at Beaumont boasts three recreation centers. The 25,000-square-foot clubhouse is the centerpiece of these amenity centers. The clubhouse features a state-of-the-art fitness center. Outdoors, residents enjoy a pool, two tennis courts, a basketball court, pickleball courts, bocce ball courts, six shuffleboard courts, and horseshoe pits. Four Seasons at Beaumont includes more than 500 acres of native vegetation and natural watercourses. The adjacent neighborhoods offer eight miles of walking and hiking trails to meander along. The gradual elevation changes at Four Seasons at Beaumont offer both good exercise and tantalizing views. "I often meet residents for lunch in the popular Bistro, which is for their exclusive use,” said Gay Lyon, top producing real estate agent for the area. Builder K. Hovnanian began construction of this community in 2005, with plans for nearly 2,000 homes upon completion. Four Seasons at Beaumont is on track to be K. Hovnanian's largest active adult community in the country. To appeal to as many active adult homebuyers as possible, numerous real estate options and home models include attached duplexes and single-family homes with customizable features. Homes range from 1,183 to 2,775 square feet with two to four bedrooms, two to three bathrooms, and attached two to three-car garages. Many of the modern floor plans include extensive great rooms, gourmet kitchens, spa-like bathrooms, and inviting outdoor living spaces. Nearby Interstate 10 transports residents between the Greater San Bernardino area to Palm Springs, just 25 miles east, and the Coachella Valley. Residents can get a taste of snow once or twice each winter in the Pass area, where it quickly melts away. Palm Springs offers renowned shopping outlets, fine dining restaurants, and world-class spas. The famous golf and spa resorts of the Coachella Valley include Miramonte Resort in Indian Wells, La Quinta Resort and Club, and Rancho Mirage Country Club. Geographically, the massive Riverside County is mostly desert in the central and eastern portions of the county. The western portion of the county has a more Mediterranean climate, with some forested areas. This ideal weather has produced more than 200 golf courses in the surrounding region, making it one of the premier golf destinations in the world. Four Seasons at Beaumont is surrounded by towering mountain ranges and forest. It contrasts desert flora with cool mountain passes. It would be hard to find a more diverse landscape.